I've recently moved to from 9 to Ableton 10. So far so good, some parts I like some parts I like less, but I can work with it so that's all good. There's this one issue I cant seem to find an answer to anywhere. Whenever I export a project, everything seems normal, the track gets rendered in real-time until 100%, but afterwards I get an error about a .aad file that was not found. It doesn't state that the export therefore failed, but 9 times out of 10 it results into no .wav file that was outputted. 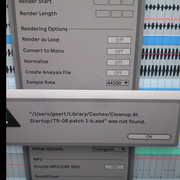 To be honest, I'm not sure if the exported .wav is always missing when I see this error, sometimes exporting works fine. ".../Caches/Cleanup At Startup/<project name>.aad" was not found. I run Ableton 10 on a Mac with OS 10.14 (Mojave). I'd definitely contact support@ableton.com for this one. Thanks Tarekith, I'll make sure to do that. Any updates I'll post here for anyone running in the same issue in the future. Update; after reaching out to ableton support; appearantly the latest OS X version 10.14 (Mojave) isn't supported yet. Releasedate for an update not yet available. Any updates? I've just come across this issue yesterday and have no idea what to do.